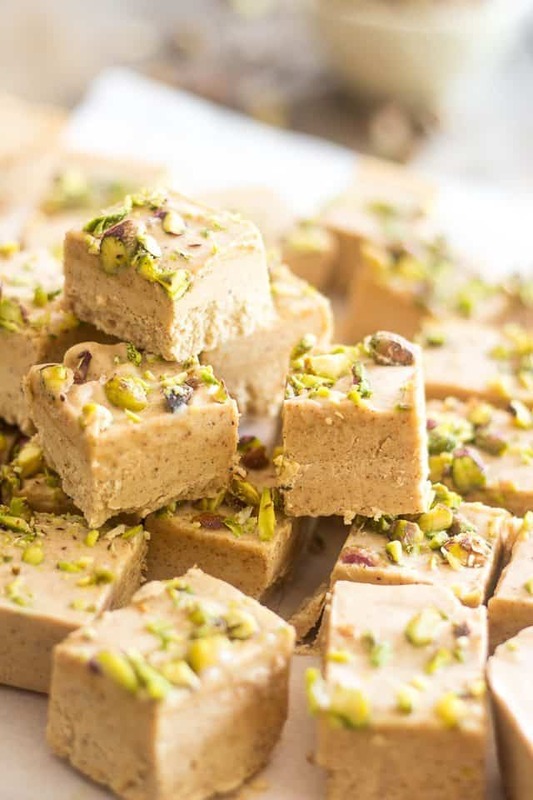 If I had to name one thing that I do like about the Keto diet, it would have to be coming up with fat bomb recipes such as this Almond Pistachio Fudge. I must admit that fat bombs are a fun and tasty way to boost one’s daily fat intake. Still, the principle doesn’t sit all that well with me. I just don’t find it natural, that’s all. I mean, it’s good as a temporary measure, but in my mind’s eye, there is something wrong with the mere fact that I have to incorporate these into my daily feeds in order to reach my dietary goals. These kinds of things should be considered a treat, not regular food. Yet, I can’t think of any other decent way to boost my daily fat intake. AH! Maybe it’s just that I don’t have enough imagination as to how to use fat efficiently any other way, yet. Or maybe it’s just the pastry chef in me who always wants to shine through and have her (LOUD) voice heard. 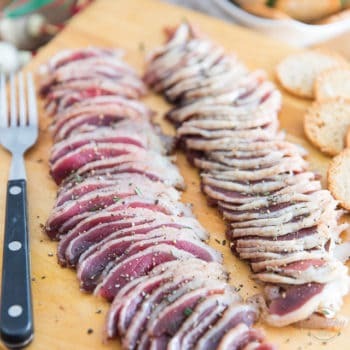 One of the aspects of the paleo lifestyle that I appreciate the most is that you are expected to feed as close as possible to what nature intended. I might be way out of whack here, but I’m pretty sure that if nature had intended for me to eat so much fat, animals would tend to carry a much higher fat to muscle ratio, and there would also be a hell of a lot more carb-free, healthy fat options for me to choose from out there! 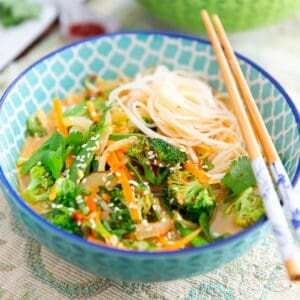 Also too, the more I eat according the the guidelines of the paleo diet, the more I feel like eating REAL food. I find myself craving less and less baked goods, namely bread, muffins, cakes and pies of all sorts. Sweets and desserts don’t appeal to me quite as much anymore. Mind you, I probably have keto to thank for that also, as I now eat close to no sugar at all and don’t really crave it either, not even when I eat “trigger” foods such as this deliciously creamy fudge, aka fat bomb. Since I completely and utterly refuse to put any artificial sweetener in my body, it goes without saying that while following a keto diet, anything sweet is just totally and completely off limits for me. Nowadays, just thinking about sugar gives me the jitters! 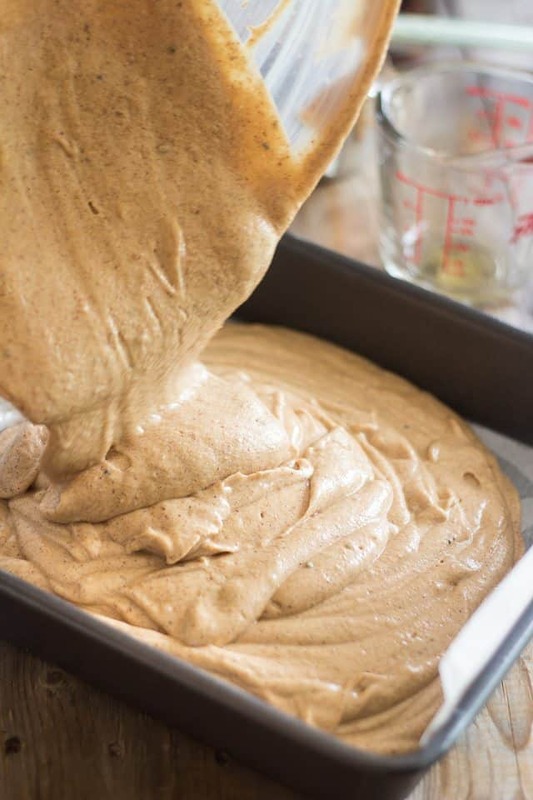 So once again, just as was the case with the Matcha and Coconut Fat Bombs, and Choconut Almond Butter Cups that I recently posted, this new variety of fat bomb that I just came up with is completely unsweetened. It’s just sweet enough for my taste, however! 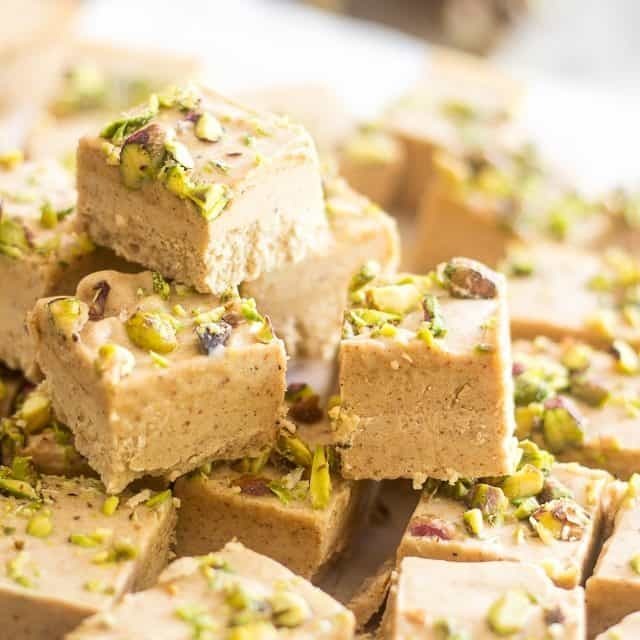 Of course, if you think you may prefer your fudge a bit more on the sugary side, you could add a little bit of your favorite sweetener to it. Of the ones that I use regularly, I think raw honey would be the best fit for this. 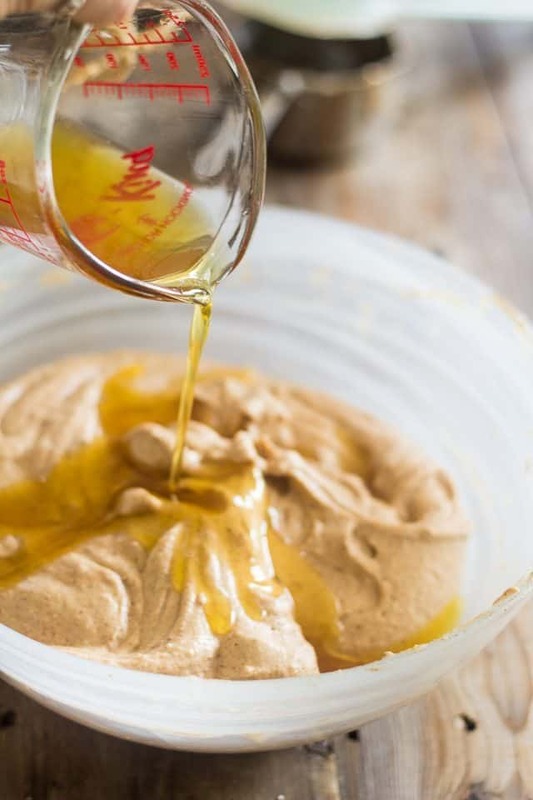 You would need to add your sweetener right at the beginning, together with the smooth coconut butter, firm coconut oil, chilled coconut milk, ghee and roasted almond butter. If using raw honey, I think that a quarter of a cup would be a good amount. Also throw in the chai spice, vanilla and almond extract and pinch of salt at this point. Note that it’s fairly important for your coconut oil be on the firm side, so send it to the fridge for a little bit if you have to. Same goes for that coconut milk. It’s not necessary that you use only the cream part (although you could very well do that if you wanted to, more fat for you), but your milk does have to be firm when you use it, so do make sure you send it for an overnight trip to the fridge. 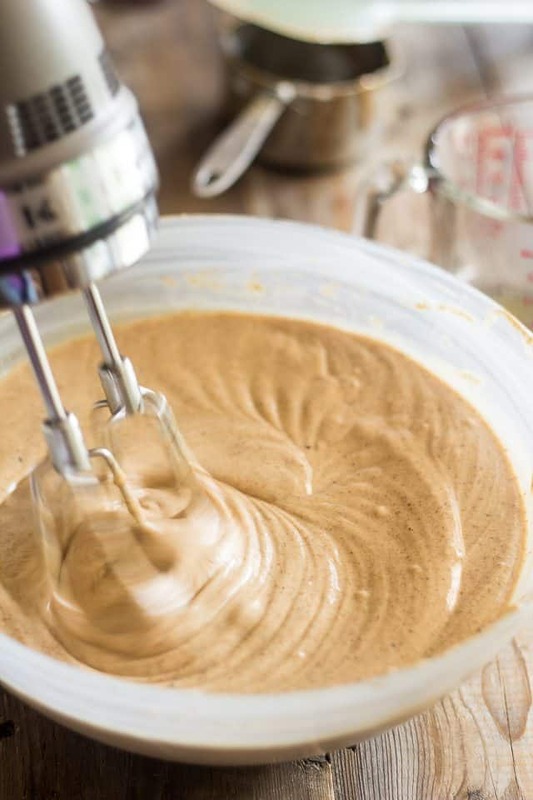 Mix all these yummy ingredients with a hand mixer, starting on low speed and progressively moving to a higher speed until all the ingredients are well combined and the mixture becomes light and fluffy. Now we need some melted cacao butter. You could either do it in a small saucepan set over low heat or place it in the microwave for a couple of minutes on high. Whatever method you decide to use, make sure you stir your cacao butter well and often. Once completely melted, pour that cacao butter right into the almond mixture. Resume mixing immediately, on low speed this time, until the cacao butter is completely incorporated. 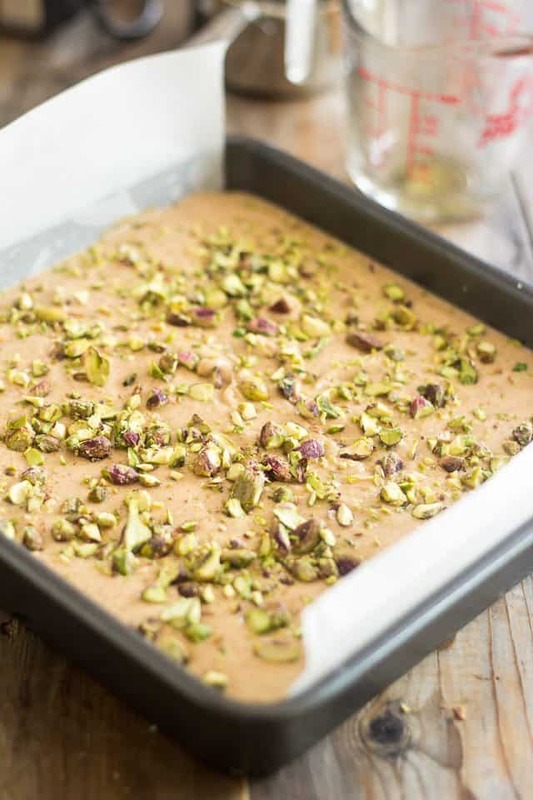 Transfer your fudge-in-the-making to a 9” square baking pan that’s been well greased and lined with parchment paper. For easy unmolding, make sure to leave a little bit of an overhang on either side of the pan. 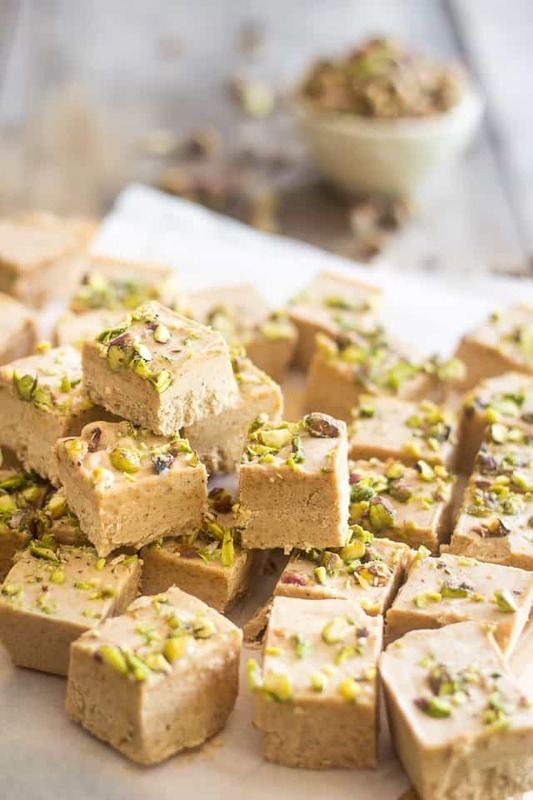 Spread your almond fudge as evenly as possible and sprinkle generously with chopped pistachios. Refrigerate until completely set, at least 4 hours but preferably overnight. Cut into 36 squares and splurge! Now imagine what it does when it hits your tongue! Hmmmmm, sweet and velvety deliciousness is what this is. Grease and line a 9” square baking pan with parchment paper, leaving a little bit hanging on either side for easy unmolding. Set aside. Melt the cacao butter in a small saucepan set over low heat or in the microwave, stirring often regardless of which option you chose. Reserve. Add all the ingredients, except for cacao butter and shelled pistachios, to a large mixing bowl. 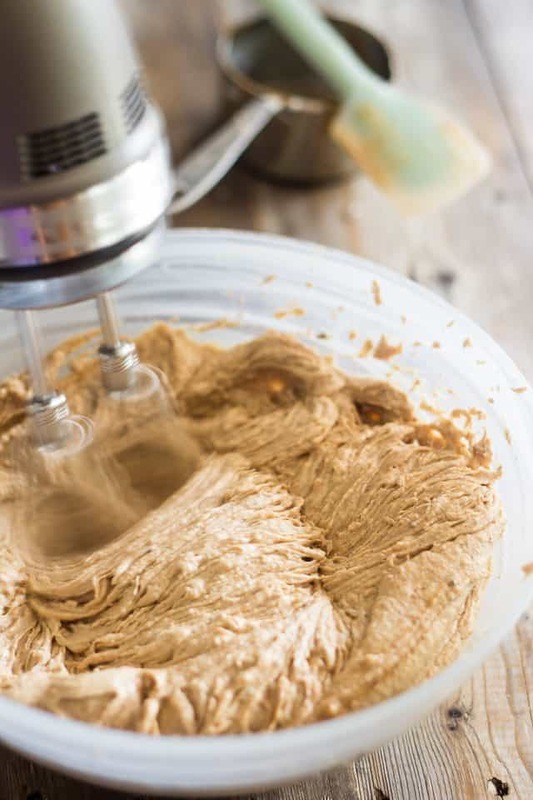 Mix with a hand mixer, starting on low speed and progressively moving to high until all the ingredients are well combined and the mixture becomes light and airy. Pour the melted cacao butter right into the almond mixture and resume mixing on low speed until it's well incorporated. 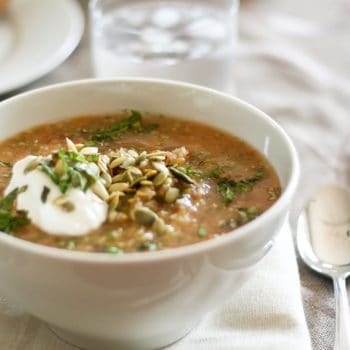 Transfer to prepared pan, spread as evenly as possible and sprinkle with chopped pistachios. *Note that it's fairly important that your coconut oil be on the firm side so send it to the fridge for a little bit if you have to. Same goes for that coconut milk. While you don’t need to use the cream part exclusively (although you could very well do that if you wanted to, more fat for you), your milk does have to be firm when you use it, so give that can a good shake and send it for an overnight trip to the fridge. Most of these ingredients you should be able to find at the grocery store or at your local health food store, but if you’re having a hard time, I have conveniently linked each product to a page where you can purchase online. 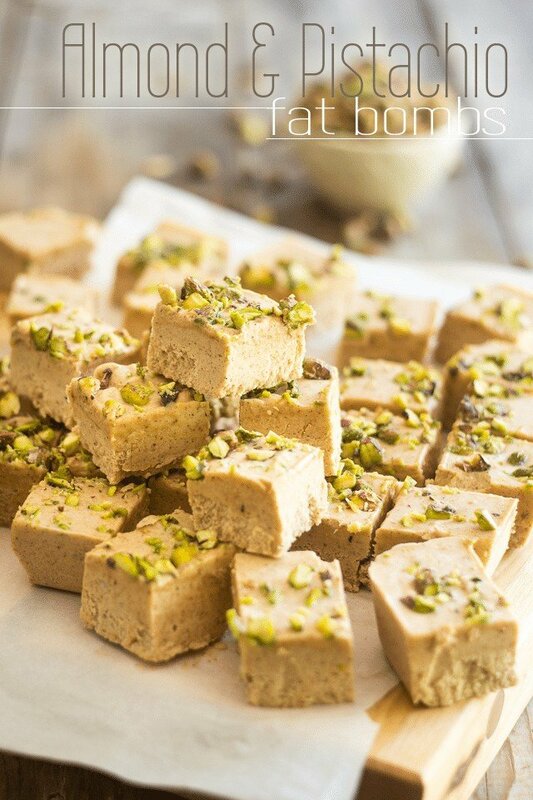 Totally loving this healthy almond fudge recipe.. they look so delicious that I had to pin them twice! Do you live far from the farmer’s market off of Heron Rd. behind Canadian Tire in Ottawa? A few of their vendors are SUPERB quality dairy. I avoid dairy for the most part. Does a high quality diary. ESP cheese really make a difference ? I’m seriously lost for words my friend. 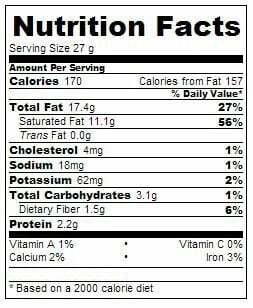 These fat bombs are killa! I didn’t want to stop licking the bowl when I made these tonight! Can’t wait to try them after they have set! Instead of using coconut milk, can you use heave cream? They are one and the same, Becky! This particular brand that I use call their product “cream” but it is in fact full fat coconut milk. ah ok! thank you! Also… maybe a dumb question… but when you refrigerate the coconut milk, it separates into a hard top layer (fat) and a watery part below. Am I just to use the hard part? I’ve actually put a little note to that effect in the footer of the recipe. Ultimately, the choice of using both parts or just the cream part is entirely up to you! ok thanks! I saw that… just was not sure what you did as the choice would effect the nutrition break down! I made them and OH MY GOSH!!!!! Deeeelish. Like… too delish!! LOL! 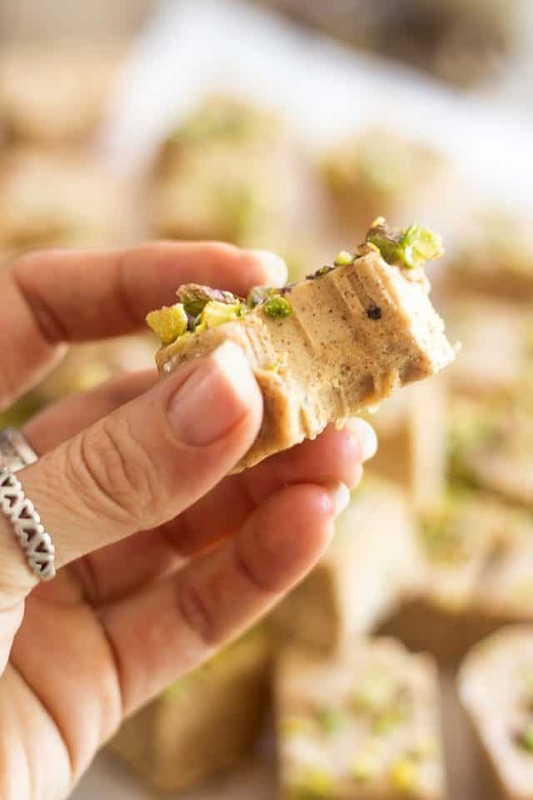 I love your blog post, ALMOND PISTACHIO FAT BOMBS, and we would love to feature it on our website, GreenThickies.com. Would it be OK for me to use one of your photos within my post? I will of course link back to your post. Absolutely and with great pleasure, Myra! So long as you don’t share the actual recipe but rather direct people to my blog in order to get it, it would be a real honor to have you share my stuff. You can pick any picture that you like from the actual post. And please, let me know when the post goes live so I can share the love, too! Can you use butter in these, in place of Ghee? I really don’t think that it would be a problem, Sherrie. These look amazing and would like to give it a try, however how long would they last out of the fridge and would they start melting? I would like to bring them to a party so they will be sitting outside for a few hours. 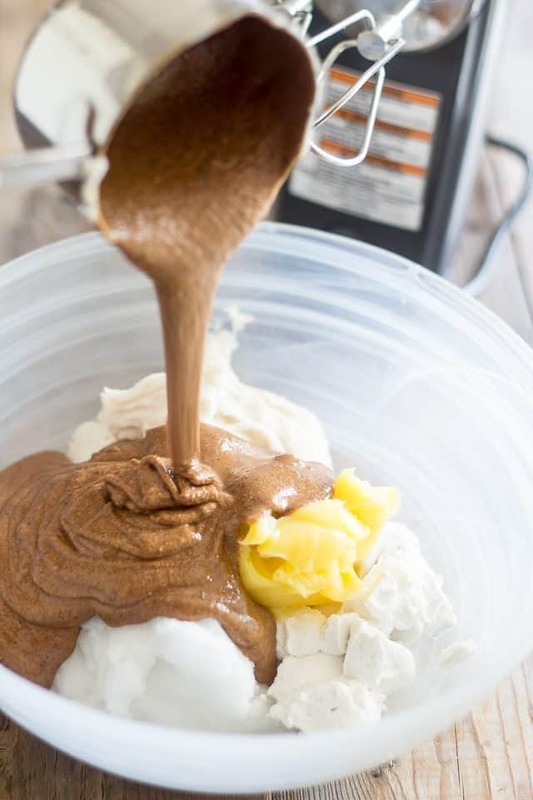 what’s a good alternative to coconut butter? Any replacement suggestions if I’m allergic to coconut? These look so amazing! 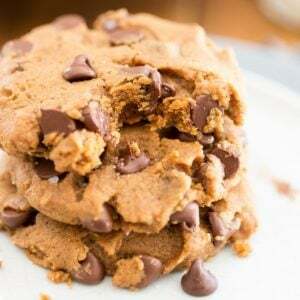 Hi, making these today, but didn’t realize I needed chai powder (hello – read the whole recipe ding-dong! ), I’m afraid I’m not going to be able to find this in-store – is chai TEA (as in tea bags) a possible substitute??? I did the same thing. I bought the individual spices and made the chai spice from there. Ginger, all spice, cinnamon, clove, nutmeg, and cardamom. 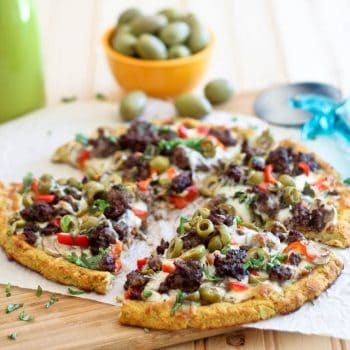 You can find recipes online. They turned out amazing! Well….I went on a wild goose chase today looking for the ingredients, particularly cacao butter and chai spice, to no avail. The chai spice that the recipe link brings up says they don’t know when it will be back in stock. What alternative brands can be used? I tried a search and pretty much just came up sugar filled chai latte mixes. We are very excited to try these – if only we can ever find all of the ingredients! How do you recommend storing these? Specifically, how long will they last in the fridge, and can they be frozen? Definitely store them in the fridge, I’d say for up to 2 weeks. As for freezing, I’ve never tried it, so I can’t tell for sure, but I think it’s definitely worth trying! They taste great but mine did not have a fudgy consistency. Seemed like the oils separated once cooled. No fluffy consistency even though I used hardened coconut oil, cold coconut milk and used my mixer. Good flavor. I added stevia to mine for extra sweetness. Not sure what I did wrong. Thanks! Nature didn’t intend it quite the way we’re doing it now, but the fatty parts of the animal were the prized parts to our ancestors. The organs, brain, marrow, and even viscera-these are very fatty and super nutrient-dense. 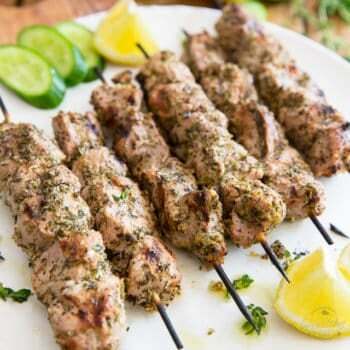 The muscle meat, which is primarily what we eat now would come after those. That’s a tough sell to modern folks. Innards have been mostly out of the diet for a couple of generations, now. So we approximate that with supplemental animal fats like butter, lard, tallow and other natural saturated fats like coconut oil. Now we have super-digestible, if designer, MCT oil, as well. It’s also why we need to eat a lot of low-glycemic/non-starchy vegetables-to replace the nutrients lost when organ meats became almost nonexistent in the western diet. I was hoping to find this comment. Just because we can only find the leanest meats in the supermarket doesn’t mean that animals only consist of lean product ! Making these again, wondering what could an alternative to ghee for gifting to a dairy free friend? Help! Technically, all of the “dairy” gets removed from butter when you turn it into ghee… all that gets left behind is pure fat so it is easily digested by people with dairy intolerance. So unless your friend is staying away from dairy for ethical reasons, they should have no problem with the ghee. Otherwise, I think I would just replace it with more coconut oil.